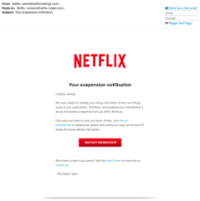 News - NetFlix Phishing Scam - Talon Systems Ltd.
Bad guys are emailing you that your Netflix account has been suspended, and it looks just like the real thing. They are trying to get your login information and your credit card data. Don't fall for this type of scam. If you want to change the settings of subscription services like this, never click on links in any email and just type the name of the site in your browser or use a bookmark that you set. Whatever email about Netflix you see in the coming weeks... THINK BEFORE YOU CLICK.